Hearthstone Village Cooperative started out in 2015 when a group of like-minded folks heard about a property for sale north of Powell River. Even though that property didn’t work out, the group decided to meet regularly to discuss and pursue the idea of forming an intentional community in the Powell River area. After three-and-a-half years of meeting and working together, sharing fabulous meals, bonding during yearly retreats, and visiting other communities, we found not just one but two suitable properties. As a result, the founding members formed two co-ops instead of one. The 3 families who preferred a more rural setting retained the Hearthstone Village Cooperative name and purchased a 42-acre parcel 19 minutes south of Powell River in the qathet Regional District, and moved in on Jan 8, 2019. The beautiful land we now call home includes a large common house, a cabin, and a sanctuary as well as other outbuildings (we even have a stage). The acreage has three ponds, a gorgeous section of the Eagle River with fabulous swimming holes, and many creeks and streams. There’s also a chicken and duck coop surrounded by a large poultry yard, mature fruit and nut trees, and a community garden. Many hiking trails criss-cross the magnificent 100 year old forest. Our group has moved into the common house and plans to begin building our homes starting in summer 2019. We will have several clusters of healthy and sustainable natural build style residences in order to preserve and protect the riparian zones and forest, utilizing locally-obtained building materials as much as possible both to save money and keep our carbon footprint low. Residents will own their own homes, leasing their lots from the cooperative. The common house is a place for community dinners, meetings, entertainment, and other public and private functions. It includes a large kitchen, dining/living room, children’s playroom, guest rooms, laundry and storage facilities, library, arts and crafts room, workshop, and food processing centre. We use a form of governance and decision making called sociocracy (sometimes called dynamic governance in the US) based on the values of effectiveness, equivalence and transparency, decisions are made by consent. The meetings flow around the circle, with everyone having a chance to speak. 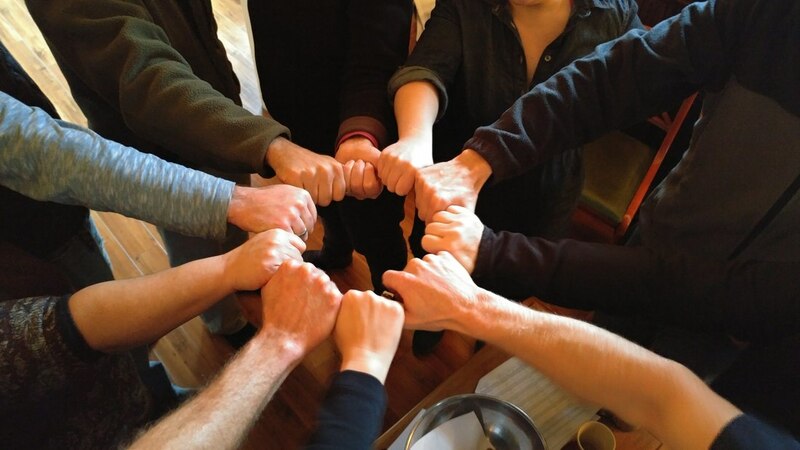 We are organized into circles (heart, head, & hand) for all the work that needs to be done. The motto of sociocracy is "Good enough for now, safe enough to try". This allows us to introduce and work with ideas, without having to be perfect before implementing - and this has proven to be one of the loveliest parts of this process. There are presently 4 families living at Hearthstone Village( 8 adults, 4 children and 3 dogs).